While not nearly as well know as Bob Vokey, Roger Cleveland is no less a virtuoso of wedge design and creation. Mr. Cleveland has now teamed with Callaway to create the Jaws Wedge, bringing his considerable talents to bear on this fine looking golf club. Combining tour proven designs such as the "C-grind" sole -- relieving excess material at the heel and toe, creating a "C" shape to the outline -- with high-quality materials like the soft 1020 carbon steel head, and using Callaway's "Mack-Daddy" grooves (basically, the deepest, sharpest, legal grooves available) they have created a wedge that would seem to be the "answer". However, in golf, nothing is ever quite so simple, and there are many other things to consider, so... Callaway makes the Jaws Wedge available in either their Soft Milky Chrome or Dark Vintage finish and offers lofts of 52, 56, 58, and 60 degrees. To round out the options, most lofts are available in both right or left hand orientation with your choice of graphite or steel shafts in Regular and Stiff flex. There is little question these elements combine to create a beautiful and useable wedge. The C-grind sole makes playing a wide variety of greenside shots not only easy, but fun. The soft carbon steel provides some of the best feedback you'll likely ever feel from an iron, and the ability to choose the right shaft material for your game is a great finishing touch. 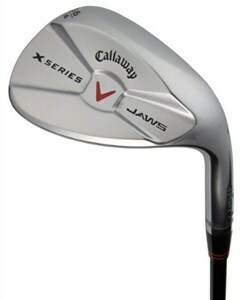 The Callaway Jaws wedge would make a great addition to nearly any golfer's bag.